Wildfires to Our North – Are You Ready Here? Wildfires burning in Anaheim and Northern California should remind you we’re in the thick of fire season, and that one could flare up any moment. Now’s the time to take stock of your emergency supplies and review your family emergency plan. Would you be ready to react if you got notice of a fast-moving fire threatening homes in your community? Assess your plan and readiness now rather than in the middle of an emergency when you might be under some duress. Be prepared to evacuate with only minutes notice. Do you have all the necessary items handy to take with you? Do you have contingency plans for different times of the day like if a fire breaks out while some family members are at work or school? Your loved ones’ safety is foremost in your mind and you want to be certain that you’re well prepared. Check supplies to make sure food, water and medications have not expired and that every family member’s dietary or medical needs are represented. Review your family disaster plan, practice evacuating, and discuss where to reunite in case phone service isn’t reliable. Check with schools or childcare providers to make sure you are aware of emergency plans and how you will be contacted. Reach out to family members, especially elderly ones, and review their plans and supplies for your own peace of mind. Register your –and other family members’– cell phones with AlertSanDiego so that you will all be notified of an emergency affecting your neighborhood. This is especially important if you no longer have a landline at your home. You can also download the SDEmergency App. ReadySanDiego.org is a great resource for a wide variety of preparedness tips. 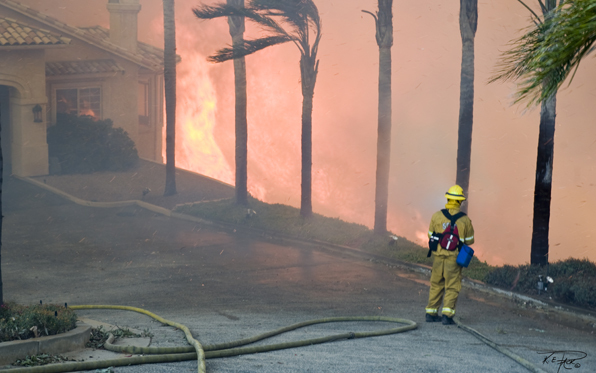 Make sure your homeowner’s insurance policy is up to date, covers wildfires and insures all the contents of your home. Take a walk around your property and ensure that you have a minimum of 100 feet of defensible space and have no touching or overhanging tree branches on your roof. The point is to reduce the likelihood that a burning ember could land on items and catch your home on fire. Remove any dead or dying trees or plants or leaves that could spread fire. Please note that during hot, dry conditions such as when a Red Flag warning is issued, residents should not attempt to use power tools as this could spark a grass fire. The same goes for wood piles or combustible items that could catch fire alongside your home. Your pets are part of your family too so make sure they are microchipped, you have evacuation items for them as well, including crates for small pets and evacuation plans for larger animals such as horses or livestock.